This entry was posted in Blog News News: Politics and tagged blog news News: Politics on June 17, 2014 by Tom Grundy. Citing sources within the Chinese foreign affairs ministry, the Apple Daily has reported that China and Britain are working on a document that will show that London approves of Hong Kong’s post-colonial development. It is said to be part of trade deals, totalling US$30 billion, which are currently being thrashed out in by UK Prime Minister David Cameron and Chinese Premier Li Keqiang. However, local democracy icon founder Martin Lee has warned that such attempts to attach business deals to Hong Kong amounts to ‘selling out its people’. Hong Kong democrat Martin Lee, Chinese Premier Li Keqiang & UK Prime Minister David Cameron. This entry was posted in Blog HK Helpers Campaign News Video and tagged blog HK Helpers Campaign news on June 17, 2014 by Tom Grundy. This entry was posted in Blog Media Watch News News: Politics and tagged blog media watch news News: Politics on June 17, 2014 by Tom Grundy. 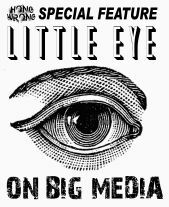 ‘Little Eye on Big Media’ Special Series: Part 1 – HSBC and Standard Chartered have been forced by Beijing to stop advertising in Hong Kong’s last pro-democracy newspaper, Apple Daily. According to Mark Simon, a senior executive at the newspaper, the two British banks were pressured by mainland authorities to withdraw advertising from the tabloid worth around US$7.6million annually. He called the move “Putin-esque” whilst HSBC told Foreign Policy that the decision was “commercial“. Standard Chartered told The New York Times that it was a “marketing decision“. The banks stopped advertising last September and the story was first reported in late May. At the time of writing, it had still not been reported by the South China Morning Post. Jimmy Lai’s paper, founded in 1995, is often critical of the local and national government and played an integral part in the 2003 protests that led to Hong Kong’s first post-colonial leader, Tung Chee-hwa, stepping down. More recently, the Apple Daily was first to publish an expose on the wealth of the Communist Party elite. Lai continues to donate millions of dollars to local pro-democracy causes. Popvote, the HKU platform set to be used in a city-wide democracy referendum this weekend, has been targeted in an extensive cyber-attack. One of the Popvote servers received ten billion ‘requests’ in just 20 hours – flooding the website with traffic and forcing it offline. 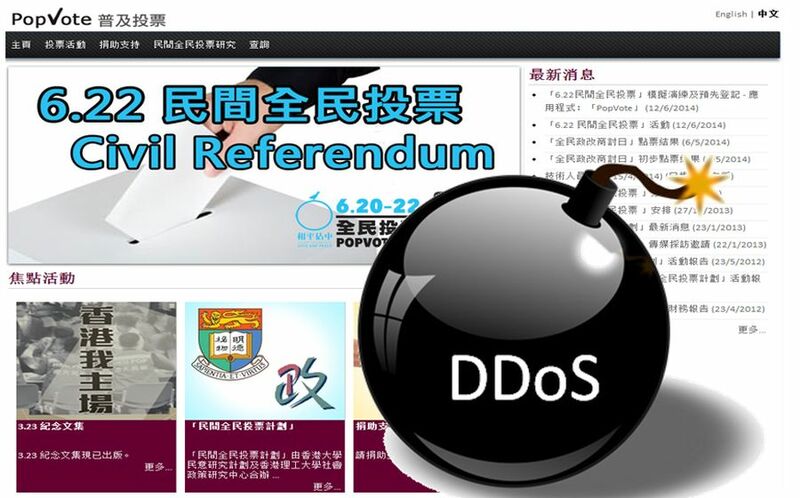 The Distributed Denial of Service (DDoS) attack – which originated locally – is still preventing Hong Kongers from registering to vote for their favourite plan for democracy this Sunday. Around 20,000 people successfully registered before the Amazon-hosted system was paralysed. Organisers have urged citizens to turn up in-person at polling stations as another attack may occur this week. PopVote is working with Cloudfare’s Project Galileo, an initiative that helps combat such attacks, but the security system itself struggled to absorb 75 gigabytes of malicious traffic. Kenneth Carter, Counsel at CloudFlare, said that they “do not discuss our customers or their account status without their permission“, but it is understood that they remain committed to protecting the PopVote network.